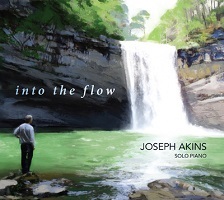 I have reviewed Joseph Akins for a number of years and his music is always consistently accomplished and oftentimes introspective. I guess I should address him as Professor Akins, as he is a composer, keyboardist and pianist as well as a professor at Middle Tennessee State University. Usually, I just call him Joey. He knows what music is supposed to sound like and he produces it characteristically with a touch for the tranquil spirit. His latest effort, Into the Flow, takes on the movement of nature and water and delights us with twelve contemporary solo piano tunes. If anything Akins is a genuine romantic, and he infuses his work with the love of many things, his wife, the world around him, and his strong love of music. His title tune, Into the Flow is a warm ballad that sets the flavor and pace for the entire recording. He suggests we jump in with both feet and eyes wide open into a world we oftentimes fail to explore even when it is in our own backyards. Akins pays tribute to his lovely wife on the tune A Pretty One for Unita. She herself is a performer with a well-known gentle spirit. I think that Joseph portrays her perfectly within the tune. She is an empathic, sweet person who loves the woodlands as much as the water. Her caring, gentle nature is why fairies dance in a ring in the moonlight. The Waterfall Waltz had the flavor of an Erik Satie composition and I liked it for that. It is a meandering whirl that cascades in the mind. The tempo is easy and carefree. You can imagine the water splashing, making rainbow prisms in the air. The music suggests a coolness in the air, the sky a definitive blue, and the world, slowing down to your speed for a change. Joey's tune Winter is Here has all the makings of a good storm. In the song the wind howls at your back, the snow comes down first in pellets and then, as the air freezes more, as flakes as big as your eyes. And as in any storm, the energy finally disperses and a quiet falls on the land. The whiteness is comforting for some, magical for others. Foster Falls has a lot of pomp and circumstance, as if it is a grand march. The magnificent falls, located in Sequatchie Tennessee, while not very high, provides an inspiring landscape for Joseph's fluid music. The sound is more than carefree, it is almost jubilant. The falls are featured on the cover of the album and it is no surprise why. Ghost of Wee Mill Hollow was an odd little melody, but Joseph always seems to include something like this on most of his albums. The tune suggests that somewhere around Chickamauga, Georgia the forest is thick along the roads. The rocky hillsides are inclined and smooth. The air is heavy and the noises, well, the noises are sometimes chillin'. It is a fun score that has just the right amount of mystery in it. The final cut is another ditty, this one improvisational in its creation, called Cosmic Microwaves. I found it to be a most serious piece despite its label and one of my favorites on the recording. There is a depth to the tune, a melancholy air that was contemplative as well as memorable. Like microwaves, the nuances are unseen, but not intangible. Joseph, the author of five previous albums, proves himself as composer and artist in another foray into a world of elemental environments that delight the mind as well as the ears. The fact that he imbues a romantic theme in his music is a treat for the listener.